Place your mouse cursor over the desired product category- a drop-down menu will open that corresponds to the selected section. points that you will receive for this product. Place your mouse on the gift icon and find out what promotion the product is part of. You can add a product to your favourites by clicking the heart icon. When you place your mouse cursor over a product with different shades (such as lipstick), you can see the entire palette (click on the up or down arrow). On the product page, you will find detailed information: properties, shelf life, composition, size chart (for clothes and shoes), similar or companion products, customer reviews. 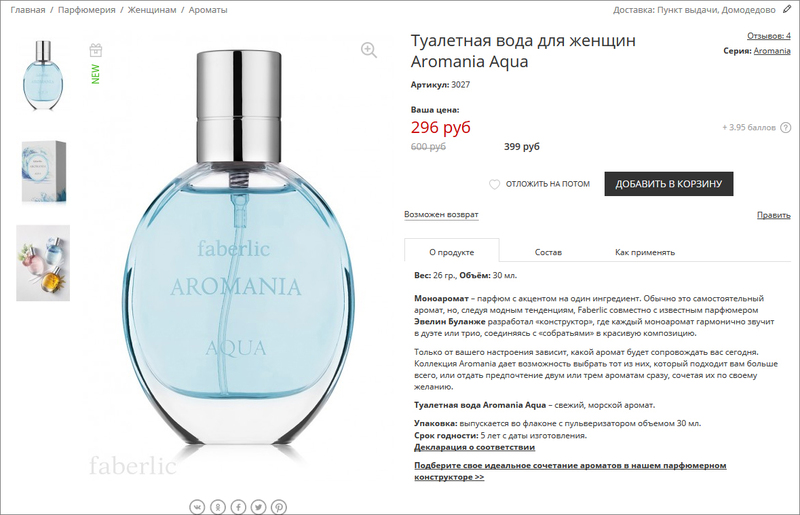 Here you can also share a link to the product on social networks and add it to your cart. If a product is not in stock at the warehouse, use the "Notify of availability" function. When the product is back in stock, you will receive a message in your personal profile. After selecting all products, go to your cart and click on the "Proceed to order placement" button. You can add some discounted items to your order during the 1st step (the discounted price is recalculated during the 2nd step). Some discounted items are selected directly from your cart- during the 2nd step of order placement, in the "Promo discounts" section. A list of all promotions with their ordering methods is published in the Catalogue News section at the beginning of each catalogue period. 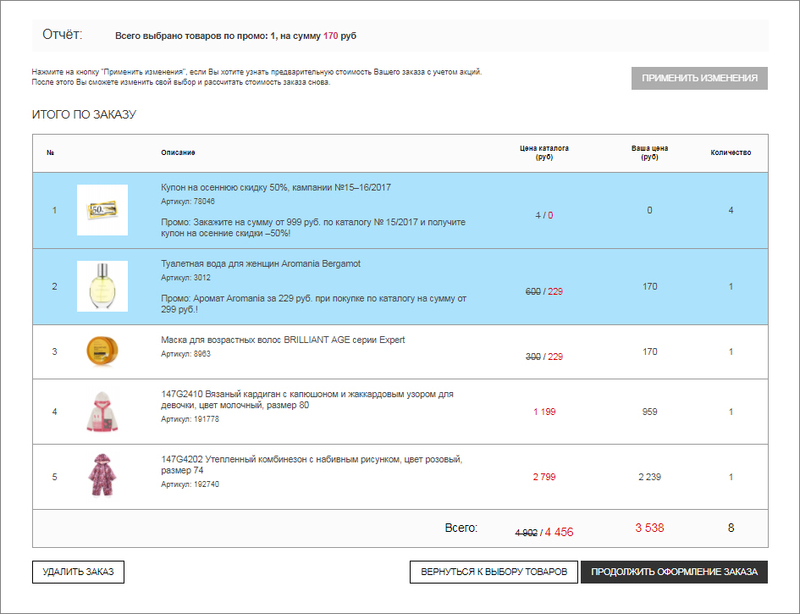 During the 2nd step of your order, you will see tabs with possible promotions. Their makeup depends on the current catalogue and which promotions' conditions you have met. When you click on a set of promotions, a list of products at super-prices opens. 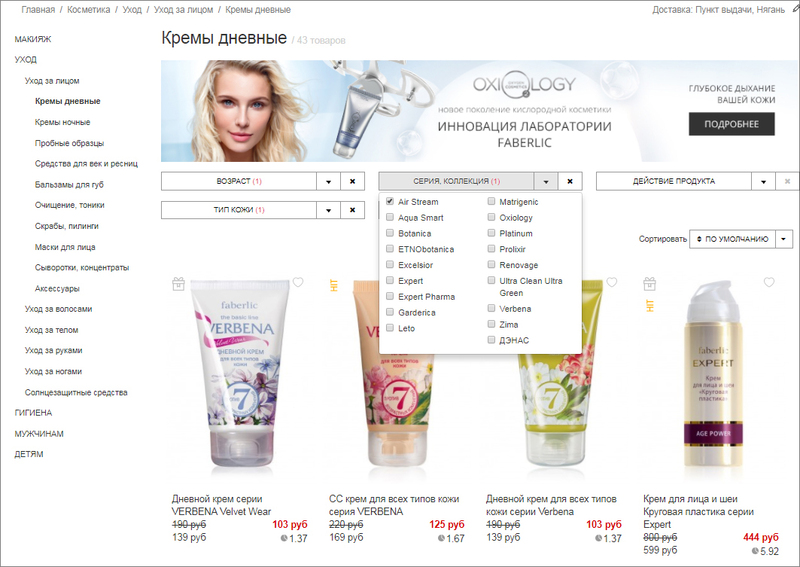 Find the promotion you want, and click on "Choose products". Enter the number of products, and click "Choose" again. During the 2nd step of your order, supporting materials for business may be offered (discount catalogues, samples, etc.). To opt out of the suggested products, click on "Opt out" or the trash can icon , then the "Apply changes" button. Some promotions may not be displayed if the total amount of your order is not enough for the promotion to apply. In this case, return to step 1 of your order, add items to your cart, click on "Apply changes", and the promotion will show up in step 2. The "Report" line provides you with the total of promotional products: their number and cost. 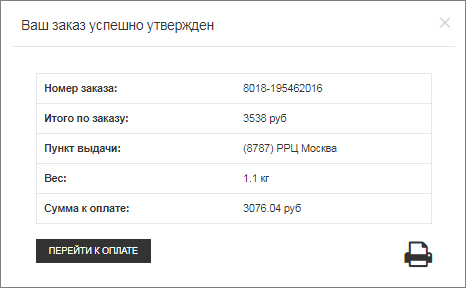 Below, you will see the "Order Total" module, which is a list of all ordered products. Products purchased on promotion are noted in blue. The final line shows: the cost of your order at catalogue prices, the cost of your order at your prices, and the amount of products in the order. To return to step 2, click on the "Return to promotion selection" button. To go to the next step, click on the "Continue checkout" button. The "Order Approval" tab will open with a "Payment" module, account information, and order discount. Click on the "Approve order" button. A window will open with order data and the final cost. From here, you can proceed to payment or print the order.